THE much-anticipated commission of inquiry into the August 1 post-election violence finally opened at a Harare hotel on Tuesday with the first witnesses speaking of how they witnessed supporters of the MDC Alliance ramp-up acts of violence in parts of the Harare CBD. The seven member probe team is led by former South African President Kgalema Motlanthe. The first witness was one Patricia Ruzawi, a local elections observer who told the commission that on the day in question, she witnessed hordes of MDC Alliance supporters pelting a Zanu PF banner at the party headquarters. Nyasha Zenda, a Zanu PF losing candidate for the Harare Central council election, said he was confronted by a group of MDC supporters who had recognised him and went on to set his personal campaign bus worth US$100 000 alight. "Someone phoned me that there was violence where my bus was parked, so I drove into town to check. "After I had parked my other vehicle somewhere because roads had been barricaded, I met a group of people who identified me as a Zanu PF candidate. They started shouting at me. "When I got to where my bus was packed, I got in and they charged at me, throwing stones at the bus. "There were some 20 to 30 people stoning my bus. "One of them got inside the bus and asked if I wanted to be burnt together with my bus or I wanted to vacate. I was then thrown outside and that is when they set my bus alight," Zenda said, adding that he could only identify his attackers as MDC through party t-shirts they were wearing. Peter Kadzimba Zimowa, a Zanu PF employee, said he also witnessed MDC supporters attacking a billboard at the party headquarters. The probe team, which comprises both locals and foreigners, was set up by President Emmerson Mnangagwa following an uproar over the killing of six civilians by the army two days after the July 30 national elections. No one has come up to claim responsibility for both the violence and the killings. 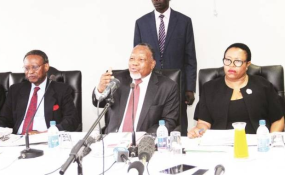 Dozens more witnesses are expected to come before the commission to present what they knew about the country's most violent episode since the 2008 presidential run-off election as Motlanthe called for more eye witnesses to come forward. "We have urged all those eye witnesses and all those who may have information that can assist the work of the commission to please come forward," he said. The ex-President also indicated that since the day the commission was sworn in, it has been seized with developing a detailed work plan. The inquiry team is set to complete its findings within 3 months with President Emmerson Mnangagwa promising to publish the outcome.